This blog post was co-authored by Kiran Madnani, Principal PM Manager, AIM India. Alerts are an important mechanism for customers to get notified about issues early and to take automated actions to resolve them quickly. With Azure Monitoring Services, you can set up alerts to monitor the metrics and log data for the entire stack across your infrastructure, application, and platform. Given how integral it is to the monitoring experience, we are excited to announce the preview of a new re-imagined user interface to create and manage alerts for any resource from a single location in the Azure Monitor blade in the Azure portal. 1. A single consolidated view with an aggregated summary of fired alerts triggered by metrics and logs at a glance. 2. A single consolidated view for viewing and managing the underlying alert rules across metrics and logs across multiple subscriptions. 3. A single simplified authoring experience for creating an alert across resources. 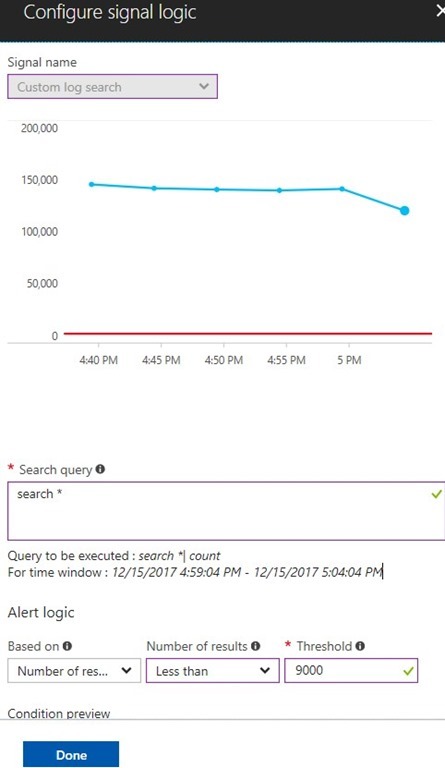 In addition to the new alerting experience, we are also pleased to announce the preview of alerting on log search in Azure. Log search is a powerful capability that allows you to view and analyze log files. We are adding the capability to allow you to set up log query-based alert rules in Azure Monitor. Update February 6, 2018: We have added Activity log alerts to this new alert experience. Try it out and let us know your feedback! You can start using the new Alerts in preview today. To learn more, visit our documentation and don’t forget you can provide us feedback by reaching out to azurealertsfeedback@microsoft.com.